This crag suffered damage during the 22 February earthquake and should be avoided (see comment below). From Evans Pass drive 1.2 km towards Godley Head. Park at the obvious lay by, walk 100m further along the road and then straight down the spur for 4–5 minutes. 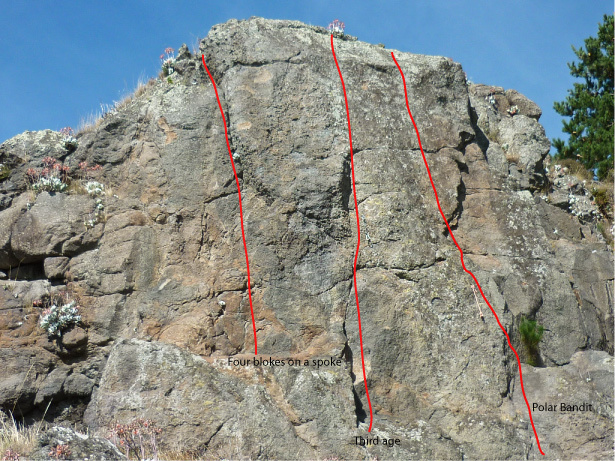 The corner/crack on the highest buttress mass. 2 bolts and natural pro. Reddish wall 5 metres right of 4 blokes. 3 bolts. Two metres right of TA. 3 bolts and natural pro. Shallow groove/corner 3 metres right of PB. 2 bolts, natural pro, chain belay. 6 metres right again. Small overhang. The 4 routes from the left appear unaffected by the quake but the next 2 are totalled.Photo's to come.